The CAO Champions II sampler showcases an all-star assortment of some of CAO's finest. All of the premium stogies in this sampler have been rated 90 and above by Cigar Aficionado magazine. As if that wasn't enough, each Champions sampler comes packed in a slick leather CAO travel case. Ten great cigars and a parting gift...a travel humidor to boot! The CAO brand is awesome and this sampler gives you the opportunity to try many of their offerings. Not only it looks great, but the range of flavors is just amazing. 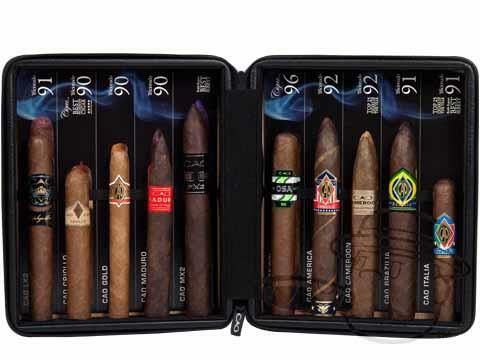 Ten great cigars and a travel humidor. I am very pleased. Great selection of quality cigars...and I got a travel humidor to boot! Excellent value, after this selection I now have 3 smokes to add to my house selection. CAO Champions 2 Sampler is rated 4.8 out of 5 based on 12 customer ratings.